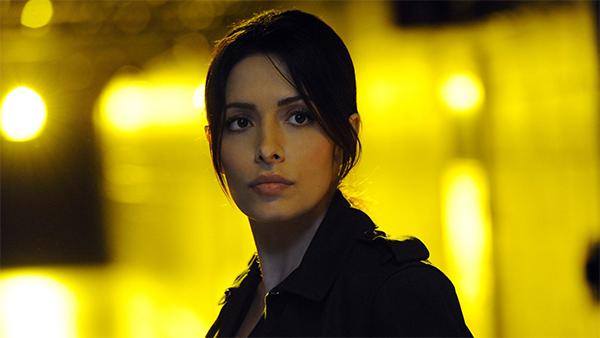 Fan Forum > TV Shows - Past > Alias > Jenny/Sarah Shahi Appreciation #2 ~ Currently chasing you in your dreams on "Reverie"! Jenny/Sarah Shahi Appreciation #2 ~ Currently chasing you in your dreams on "Reverie"! Welcome to the Jenny/Sarah Shahi Appreciation Thread! Jenny is a 20 year old woman who worked with Will Tippin at his newspaper job. She and Will had been in a relationship for a year before Will broke up with her after being kidnapped by Jack Bristow. She got angry and quit being Will's assistant. Mini Bio: Sarah Shahi was born on January 10, 1980 as Aahoo Jahansouz in Euless, Texas, to an Iranian father and Spanish mother. She is a former NFL cheerleader and a descendant of a 19th-century Persian Shah. She attended Trinity High School and Dallas Southern Methodist University, studied opera and majored in English. As a teenager, she won several beauty contests, and took first place in the Miss Fort Worth USA pageant in 1997. She joined the Dallas Cowboys cheerleaders and was part of the 1999-2000 squad. While working as an extra on the set of Dr. T & the Women (2000), she met director Robert Altman, who encouraged her to move to Hollywood to pursue a career as an actress. She is best-known for her role as the Mexican-American DJ "Carmen de la Pica Morales" in the Showtime series, "The L Word" (2004), which she joined in its second season and for her portrayal of ISA agent Sameen Shaw on the sci-fi TV show "Person of Interest" (2011). Shahi gave birth to her 1st son, William Wolf in 2009 and to twins (her 2nd son & 1st daughter) Knox Blue and Violet Moon in 2015. Cast Appreciation #3 ~ We're still glad when we get to see them on TV. Jenny/Sarah Shahi Appreciation #1 ~ She's only in it for the dog! so unlike the Sarah we're used to seeing. Looking good in a different way. that's what we're used to. It's the Reverie finale this week, I think. we must have had the same source, then. it's started over here too. aww, we'll forgive the zoom then.